Gift Book At The Printers! Perre left us for one long awful day. He got up at 5am, made espresso, and the last thing I heard was the mini starting up outside. He brought back footage to show he wasn't seeing any other cats while he was away, but he could have edited them out. 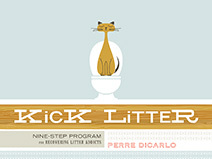 Nine-Step Poster Hidden In Dust Jacket! Perre explains how the poster works. (He's the big guy who feeds us). Videos Of Cooper On The Toilet! HA, HA! 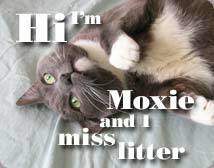 Since we've been in recovery, our sponsor's been video taping our confessions and photographing the long hard road from litter box to bowl. In the back of my mind, I kind of knew the videos and pictures would eventually make it online. I don't feel as embarrassed as I expected - maybe it's that the first three are of Cooper? 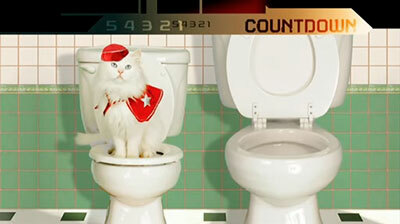 Why does pop culture love cats on toilets?